Even in the face of adversity, Hillary Clinton is a total badass. The first female presidential nominee has shown incredible emotional and mental strength this election, and to say she has overcome some challenges would be an understatement. Yet despite the courage she has regularly demonstrated, Hillary Clinton proved today that she is stronger than ever by making it another day without giving in to the tempting call of the sea. Yes! Just yes. The siren call of the ocean may be constantly trying to lure Mrs. Clinton to its lapping surf, but today marks one more day in which she has resisted it! The road to the White House for the former secretary of state has not been an easy one, especially given the constant draw of the glassy blue waters that stretch as far as the eye can see. Not only is she dealing with being the first female presidential nominee and being brutally attacked by her opponent Donald Trump, but she also has to resist the urge to immerse herself in the sea’s limitless briny abyss every single day. No matter how far she is from an ocean, Mrs. Clinton’s ears become filled with soft, soothing voices, begging her to walk toward them until she is finally one with the water—but in pure presidential fashion, she handles such challenges with poise and grace. You go, girl! You better believe that when Hillary Clinton finds herself standing barefoot on the beach, staring longingly at the salty tides, desiring only that her body be slowly overtaken by the unceasing blueness, she doesn’t give up without a fight! Although the sea sings to her morning, noon, and night and begs her to venture deep inside its clear, endless waters, the Clinton campaign has yet to waver. Hillary’s tough facade may have nearly cracked last week when she reportedly went to the top of a remote lighthouse in Maine and reached her hands slowly out to the crashing waves. But once she awoke from her trance and took one last sorrowful gaze out to sea, she was quick to return to the campaign trail. You don’t get this far in an election without some serious firepower, and at this rate, Hillary looks like she just might keep resisting the sea until November. 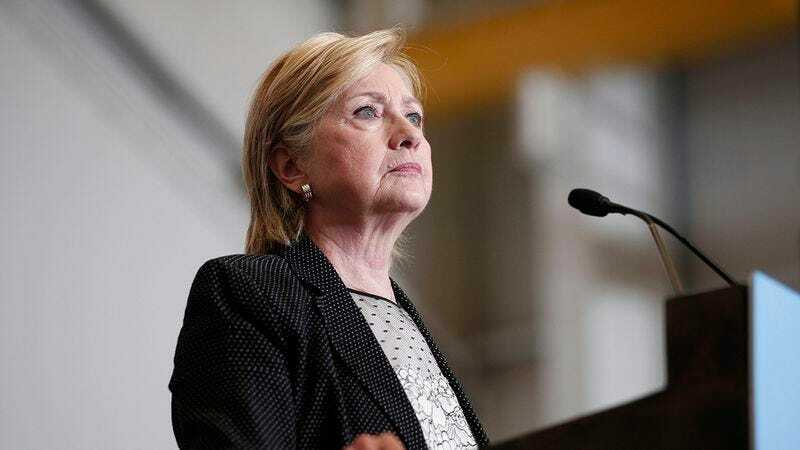 One thing is for certain, HRC has already proved her mettle, and she has the fact that she is not currently walking unblinking into the chilly waters of the Atlantic to prove it.